The OSADL Test Rack was designed by kernel developer Thomas Gleixner. 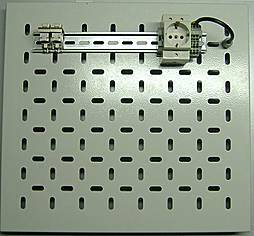 It consists of an open 19" industrial rack the upper and lower half of which can be configured either for individually assembled embedded systems or for standard PCs. The picture at the left (click on it or click here to display it at a higher resolution) shows a version for eight embedded systems. Every slot is equipped with a 220 V/50 Hz~ power plug-in and two RJ45 connectors. The power plug-in is connected to a remote power switch. One of the RJ45 connectors provides a 10/100/1000 Mb/s network interface of a manageable network switch, the other links to a serial port of a terminal server. The manageable network switch allows mirroring of individual ports for diagnostic purposes when network sniffing is required. The 8-way power switch, the 8-port network switch and the 8-port terminal server are mounted in the transitional zone between the upper and the lower half of the rack. While standard PCs are put directly on a simple rack shelf two in a row, special shelf tablets have been developed for embedded systems. These tablets (see picture below, click on it or click here to display it at a higher resolution) are equipped with a DIN rail. This facilitates the individual assembly of a particular embedded system either with standard DIN rail power supply or with special power supplies. The tablets can be removed easily and be used on the desk, whenever necessary, since the interface connection is standardized to avoid any hassle with a company's in-house serial and power connectors and exotic power requirements. In the future, we may no longer accept embedded systems for testing or bug fixing, unless they come pre-assembled on the OSADL Test Rack tablet. Appropriate empty tablets along with a description of the required pin assignment of the serial connector can be purchased from Linutronix. Currently, racks with a total of about 100 systems are running at our facilities in Heidelberg, at Linutronix and at other OSADL Testlab locations. Every time, a new release candidate of a Linux kernel is produced, it will be compiled for all systems and run on all of them to detect regressions. Automatic test scripts are used for this purpose. OSADL member companies can purchase OSADL Test Racks and operate them within their facilities. Upon request, particular systems that are installed on such OSADL Test Racks can be included in the automatic testing of release candidate kernels. Remote operation is done via VPN over the Internet. OSADL member companies and who have only a small number of boards to be tested can hire rack space and submit test tablets equipped with the boards to be tested which will then also be included in the automatic testing of release candidate kernels. This service is also offered to non-members. More details are available at the description of our services with an Internet contact form. The OSADL Test Rack represents an important component of the release mechanism of the "Latest Stable" PREEMPT_RT Linux kernel version. Customized CPU boards of OSADL members and popular general purpose systems are tested in OSADL Test Racks at the various OSADL testing labs against every newly built real-time kernel. Test results of a number of systems are continuously updated and made available on this Website. Both OSADL members and non-members have access to the OSADL QA Farm to test and monitor industrial processor boards with respect to real-time capabilities, performance and stability. A pricelist of such services is available here; in addition, an Internet form is available to request information about a particular project.